This product is really sturdy. The cats are just getting used to it and sniffing around. I think they will really like it once they are comfortable around it. Right now they are curious. This cat tree will give your feline friend a fun place to play, relax, stretch, scratch, and more. Made of durable wood, this cat furniture is covered with faux fur in an attractive brown color that blends well with many home decor arrangements. 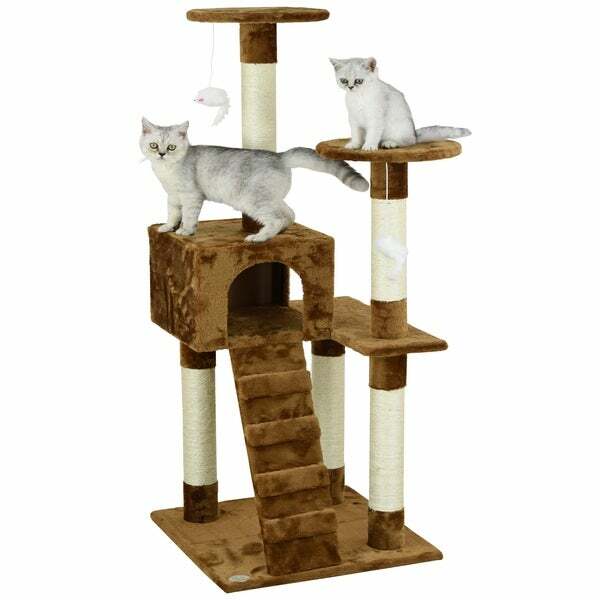 The multiple cat scratching posts give your cat something scratch besides your valuable furniture, and they are covered with durable sisal rope. With a dedicated cat ladder, hanging mice toys, and upper perches, your kitty will absolutely love this versatile cat condo. I found this online at such a great price for my new cat that I had to get it. When it arrived it came in pieces but was really easy to assemble. I do have to point out some very minor flaws though. I understand why but I suggest the ladder not be as steep as it is. It was discouraging to my cat to approach such an incline immediately. Also, the dangling mice aren't of the greatest quality. My cat very quickly tore the string and punctured one of the mice. Though, the stand itself was great. After getting comfortable with it Milkdude loves to sit on top and watch while I clean or do whatever else I'm doing, he also really likes the space on top of the box. The carpet holds well, as my cat likes to claw at it quite a bit. The scratching post parts are pretty solid. Though it would seem that maybe they would need to be replaced after a year or so. For a single cat house, I definitely recommend this product. Just...be prepared to see dangling strings and mice that have vanished. My cat loves this cat tree! i couldn't get her to stop scratching my chair, til now! she started scratching on the posts a day after i got it and now she uses it daily. she loves the hanging mice, although she popped one off the first day, just tie another mouse tail to it, and all is well. my other cat won't have anything to do with it yet, but i'm waiting to adopt 2 kitties, can't wait til they get to play on it, they're gonna love it. i'll bet my other cat will play with it once he sees how much fun the kitties are having on it. it's very well, made, with good materials and looks nice in my living room. Cats always love anything that comes in a box, but this one was amazing. My cat immediately wanted to play with the mice that were hanging from the posts and was irritated that she couldn't take them with her. She hasn't been able to pull them off, as others have stated. I think the ladder is a bit wobbly, but my cat is probably too large to use it anyway. The rest of the structure is completely sturdy without any need for something to prop it up. The "cat house" is too small for a large indoor cat (my cat is 18 lbs. ), but she definitely squeezed her way in for a treat or two. If your cat needs something to just climb on rather than the furniture, I would recommend this. It is very cost-effective and easy to put together. My cat is leaving the furniture and curtains alone now that she has this cat tree. It is well described, well made, very sturdy and was totally worth the price. This is very durable we will have it for years and the cat loves it. This is a sturdy piece that can handle roughhousing cats. I purchased this to try and keep cats off our new sofa. They enjoy playing and snoozing on it. If you have larger cats like we do, you may want to order the next size up. The platforms are a little small for them but they still enjoy. This came the day before someone dumped another kitten on our front porch and she has really enjoyed it. Please people, spay and neuter your pets. I'm replacing this product. It is cheaply made. The posts are so wobbly my cat will fall off when playing. It might be okay for a kitten but not an adult cat. When my cat jumps on it the whole unit moves. It is on hardwood floors. My cat is 10 lbs and his front paws and legs hang off the pads. He has never used the cubby. We tried to reinforce the posts but they just started wobbling again. Had it less than a year. Cat likes it but am buying something safer and sturdier. It's sturdy, took all of ten minutes to put together, looks so much nicer than similar crap they had at the pet store for 3 x's as much & the cat loves it. Not impressed, but didn't hate it. The rocked a but and the rope covered area quickly frayed, but what can you expect with a cat tree. Wouldn't buy it again though. Well built. Lasted for many years. Thick carpet. Not cheaply made at all. Was impressed. Cassie 2 yr. old F-S, loves, loves, loves. Very easy to assemble and sturdy. Has held up very well. The cats really enjoy and entertaining for us as well. cat loves it plays on it all the time even catch her sleeping in it. Easy to assemble and sturdy. My cat loves to hide in the cave and look out the windows and escape from to dog on the highest perch. It holds up well and the color just blends in. A good price. My cat has climbed on it once. Sniffed it and never returned. The stairs are pretty useless. They don't attach well and the slope is too steep to try to climb. The base needs to be heavier to avoid tip over when used for scratching. Sounded like would be sturdy. Cannot imagine having cats fall. Have looked and looked. Hope is as advertised. "How many pounds does this support?" Hello jessica98, Overstock does not weight test items. Thank you for shopping with us, and have a great day!